Japanese chisels (nomi), along with saws (nokogiri) and planes (kanna), are one of the most essential tools for the Japanese woodworker. 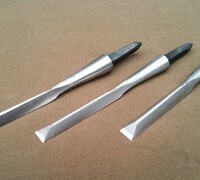 They are used for boring holes into or shaving off small parts of timber. The nomi blade has a similar construction to that of a plane (kanna). It has a steel core for carving wood and is sandwich-welded by softer metal plates (jigane) that form the outer shell of the blade, the shank, and the part that is inserted into the handle. 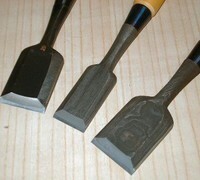 There are several types of nomi but the two major categories are striking chisels and push (or paring) chisels. 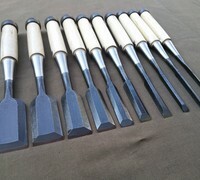 Striking chisels include bench chisles (oire-nomi), timber chisels (chu-tataki-nomi, chu-usu-nomi and atsu-nomi) and mortise chisels (tateguya or mukoumachi-nomi), which are used with a hammer. 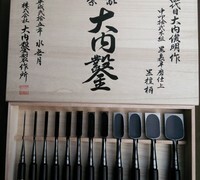 Push (or paring) chisels (kinari / usu-nomi, umeki / shinogi-nomi, sashi / tsuki-nomi) include dovetail chisels (yama-ari-nomi) and are used without a hammer. Please browse through our extensive collection of Japanese chisels / Nomi, and contact us with any questions or if there is anything you want that you do not see here.